Last year at the annual SOE Live convention, SOE caused a stir by announcing the first true sequel to EverQuest in nearly a decade—EverQuest Next would be the successor to EverQuest 2, released back in November of 2004. And then SOE went dark on EverQuest Next, focusing instead on EverQuest Next: Landmark. It was all a bit confusing, as SOE tried to outline the difference between the two games. When I say "a bit confusing" I mean "It was a huge mess," and SOE finally stripped the name of the latter to simply "Landmark" a few months ago. Still, what's the difference between Landmark and EverQuest Next? And where did EverQuest Next disappear to? It's fitting that we got our answers Friday at this year's SOE Live. Dave Georgeson, director of development for the EverQuest franchise, said he gets asked all the time, "When are you guys going to start working on EverQuest Next?" His response? "We're making all the systems that we need for EverQuest Next," said Georgeson, "and we're building them in Landmark." "We are building this game right in front of you," he continued. Landmark is less a game and more of a building tool, a la Minecraft. There's an element of survival planned—an imminent update announced during the Landmark keynote adds in Health and Armor traits, as well as three weapons (a sword, a bow, and a staff) and a host of monsters. However, it's an MMO-lite at heart and most people are just happy to build large structures and have a good time. But there's an ulterior motive for the developers—SOE is using Landmark to seed all of EverQuest Next's systems. An MMO is a massive undertaking, requiring the following: world-building, special items and abilities, grouping and guilds, social hubs, an in-game economy, landholding, and a ton of other complexities. Georgeson laid out his Five Pillars for EverQuest Next and showed how they're mostly tied in to Landmark. 1) Georgeson wants EverQuest Next to feature a fully-destructible world. This is already a feature in Landmark, and the tech will carry over to EverQuest Next. 2) The world needs to have tiers of depth for terrain. This system is being built into Landmark slowly but surely, with a recent update adding caves. This will transfer directly into EverQuest Next. 3) Emergent AI is key. An upcoming update for Landmark adds in enemies to the world, and this will be the start of a much larger AI component that will transfer into EverQuest Next. 4) EverQuest Next will have what Georgeson called "Rallying Calls." These are specific to EverQuest Next and pertain to how SOE plans to tell stories in the world. As such, Rallying Calls will never be in Landmark—a key difference between the two products. 5) Georgeson's final pillar is "Change the Core Game." That's an enormous and broad category, so there's no great way to sum it up. These tenets are also EverQuest Next-specific, though. That's three out of the five core pillars that are already built or are nearly built in Landmark, and they all pertain to complicated systems and foundational technologies needed to drive an MMO like EverQuest Next. It's an interesting (albeit confusing) way to build a game. Oh, and the biggest difference is still genre-related. Landmark is genre-agnostic, meaning it incorporates elements of both science fiction and fantasy. EverQuest Next, on the other hand, is a much more traditional fantasy setting (in keeping with its predecessors). Unfortunately there's still not much to see of EverQuest Next. Although Landmark is in closed beta and theoretically accessible to you, I'm going to hazard a guess and say we're still quite a ways off from seeing EverQuest Next. SOE did show off a few small details though—we got a peek at the Cleric and Elementalist classes. The Cleric is what SOE termed a "battlefield leader," charging into combat ferociously and setting the pace of the fighting. 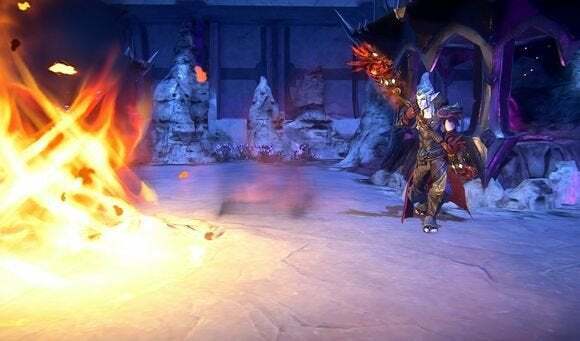 The Elementalist, as you might've guessed, uses fire and ice spells to great advantage, freezing the ground beneath enemies and then lighting them on fire. We also saw a last class, the Tempest, that functions a bit like an assassin, teleporting around the battlefield and using lightning spells. Combat is active, with elements of skill—no fire-and-forget abilities like most MMOs in the World of WarCraft vein. You'll need to time your attacks, face your enemies, etc. SOE promises you can become "good" at combat, not merely outgun your foes. Georgeson also discussed Rallying Calls extremely briefly. Basically, there are a number of Rallying Calls all happening at once—a number of large story arcs—and the quests that players choose to focus on change the shape of the world over time. Without a specific example, it's hard to really know what SOE has planned for this feature, but it sounds potentially interesting. It looks like an MMO, although tied intimately to a fascinating building/destruction system. I'm not as enthralled by the idea of another fantasy MMO as I was by the premise of Landmark and its freeform building, but I am curious to see how EverQuest fares 15 years after its original entry. As I said, though, it looks like we're in for a long wait, even if some of the infrastructure is already built.